Decleor is a brand known for mixing aromatherapy with a good skin care regime. Their products are made from using plant based extracts and essential oils to nourish skin but also relax our senses and minds. The Aromessence products and night balms are preservative and colourant free, 100% natural and 100% pure. I have always wanted to try Decleor and decided to spoil myself by purchasing a few goodies. I decided on the Decleor Aroma Cleanse. From this range I bought the essential cleansing milk and essential toner. Seeing that we are nearing closer and closer to winter in the Southern Hemisphere I thought I would turn up the moisture in my skin care cleaning routine. I have normal/ combination skin but my skin tends to go dry in winter so I need cleansers that will not strip my face from moisture. Plus I hate washing my face with face wash on winter mornings. I would prefer using cleansers that I can wipe my face clean using a cotton pad. Who else gets lazy in winter when it comes to skin care? I sure do! This paraben free Cleansing milk smells absolutely lovely. Whenever I smell it I feel like I'm walking in a gorgeous flower garden. It's perfect for dry skin because it is so creamy and gentle. The Cleansing milk has Neroli essential oil to destress the skin and makes it more radiant. It contains Almond oil which helps removing makeup and softens and soothes your face. It has a great consistency as well, not too runny and not too thick. You apply it onto a cotton pad and gently wipe your face. It cleanses the face and leaves your skin smelling lovely. Unfortunately the cleansing milk really struggles to clean off mascara. It removed my eyeliner but I still had mascara residue on my eyelashes. If you are wearing heavy makeup, eye makeup remover would have to be used before applying the cleansing milk. This product is great to use in the morning to cleanse the face and get it ready for the day. My skin felt soft and moisturised after using it. I absolutely love this tonifying lotion. Not only does it smell amazing but does a fantastic job in cleansing the face without making it feel sticky or tight as some toners do. It removed all of my makeup and dirt off my face. The tonifying lotion contains Neroli essential oil, as well as green tea water to refresh and detoxify the skin. It too is paraben and alcohol free which makes it so gentle on the skin. Apply onto a cotton pad and wipe across the face. My face feels refreshed, clean and looks visibly radiant after using this. I really adore this product. I would definitely repurchase this when I run out. 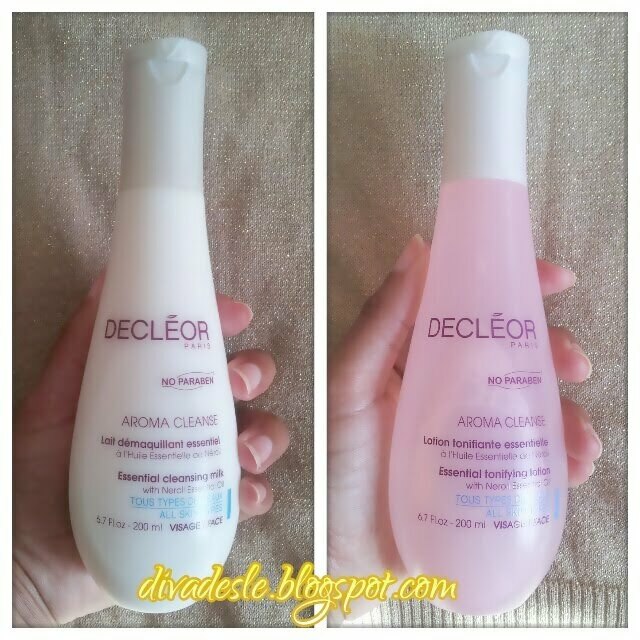 Look out for another Decleor review coming up soon. Hi sweety, I really appreciate your reviews, they are well written and very informative. I love that it's paraben free! Sounds delightful! Thanks for the review! I also need something more moisturising during the winter, def going to give this cleanser a try. Pleasure Charlene;) And thanks for reading. Great review they sound like 2 awesome products.